Stock photo of Multi-directional metal post sign and white letters showing various mountains of Banff National Park in Alberta, Canada. 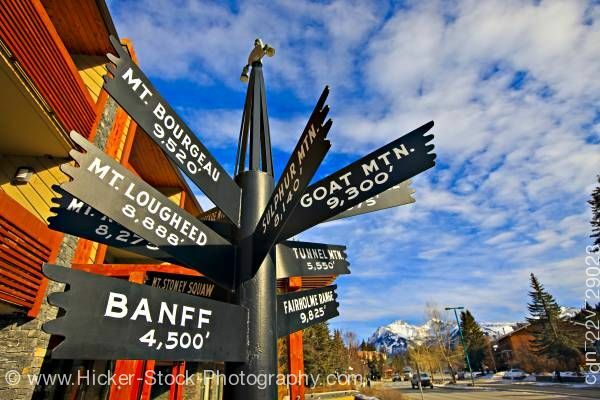 This stock photo shows a multi-directional metal sign post with white letters showing directions to various mountains. The mountains are located in Banff National Park in Alberta, Canada. Behind the sign in the left side of the background is a brightly colored orange and yellow building along with a beautiful blue sky with lots of white clouds and in the distance to the bottom right shows a small town and trees. Established in 1885, Branff National Park is the oldest in Canada and is part of the Rocky Mountains. The mountain landscape is approximately 6,641 square kilometers (6,641 square miles). Multi directional sign post along Banff Avenue pointing to various mountains, Town of Banff, Banff National Park, Canadian Rocky Mountains, Alberta, Canada. Banff National Park forms part of the Canadian Rocky Mountain Parks UNESCO World Heritage Site.